Captain Nyx Dysart has a spaceship that’s barely holding together, a crew of misfits, and no idea what she’s going to do with the rest of her life. Nyx was a proud officer of the multi-species Coalition, tasked with spreading the message of intergalactic peace, harmony, and a whole lot of love throughout the galaxy. But on her return after a lengthy exploratory mission, she found the Coalition in tatters and the galaxy spiraling toward interspecies war. Now, it’s all she can to do keep what remains of her crew together while they try to keep their beloved ship flying. 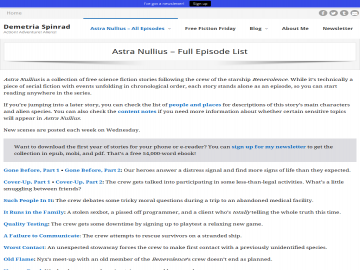 Astra Nullius has not been tagged yet. Help others find Astra Nullius by tagging it! Astra Nullius has not been reviewed yet. Astra Nullius has not been recommended yet.